From the standpoint of a rank amateur, art collecting seems like a gladiatorial sport. From who’s in to who’s out, from the déclassé to the divine, it is hard for a beginner (or even in most cases, a more experienced collector) to know the difference. Many throw away money, in an attempt to achieve some sort of ambiguous art epiphany that most likely will never come to fruition or in a more crude ambition collect for investment purposes. Whatever the case may be, the art world is a scary place —full of snobbery, pretension and condescension and worse still, rip-offs, thieves and imposters. So what to do? Give up completely? If that were the case, there would be no da Vinci or Michelangelo. No, rather, you must find someone —an art representative or gallerist —you can trust. Someone rooted to the community, understanding of your needs; while still maintaining a connection to the pulse of what’s hot and what’s not. Someone who is not afraid to venture to the “Bushwick” of Mexico City or Shanghai. Someone who is down-to-earth, but with an affinity for the whimsy. There is, for me, only one person who fits those rigorous requirements. 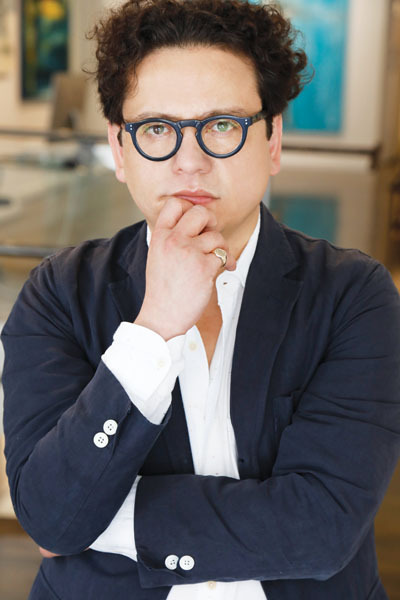 His name is Georges Bergès and we at RESIDENT are honored to have interviewed him. I believe the interview that follows is a reflection of his deep understanding of art, his passion for collection and his humanity and humility for both his artists and his clients. I hope you enjoy the piece as much as I enjoyed interviewing him! I was born and raised in California and spent some time living in Alaska during my undergraduate years. Before finally settling in New York City, I traveled extensively all over the world. I am a child of immigrant parents so I always apply a very global perspective to everything. Perhaps this is one of the reasons why I have always gravitated towards a more globalized exploration of previously overlooked art and artists—I used to always say that I want to go to the “Bushwick” of Johannesburg, Mexico City, and Shanghai —I have generally been less interested in the usual centers of art. And now that I think about it, I suppose this is also a reason why I take a more “romantic view” of the art world and practice a more person-centered approach when working with my artists and collectors. I am naturally a people person. I love learning about different cultures and life experiences and genuinely enjoy spending quality time in conversation with artists and collectors from all over the world. You’re not a native of New York, why here? New York City is special. This is a place where history feels and weighs-in like nowhere else. My excitement and romanticizing of 1980’s New York City history, and of a future filled with possibilities, created such intense feelings in me that I couldn’t be anywhere else. I could have thrived somewhere else but I believe that the life I am living now, and which I love, could not have happened anywhere else —I owe everything to New York City. It has given me so much. In a way, my gallery and daily work are homages to this great city. How do you pick the artists that are featured in your gallery? I am often asked this question. The best way I can answer it is by saying that I only work with artists that I love. When selecting an artist, I usually ask myself three questions. First, do I like the work? And if I do, then I try to figure out if I feel that by working with the artist I can take him or her to the next level in his or her artistic development and career. If not, then I may just become a collector of the work. If I see the possibility of a working relationship, then I move to the final and most important question, which is, do I like who the artist is as a person? In many ways, the art world is adversarial and tough. For this reason, it is important that there is a genuine connection between the artist and me. Trust is key. If a connection is not there, then it won’t work for me. There have been times when I have gone out with a potential artist and spent weeks talking to him or her about many different things before we even got into the art. I see, experience, and sell art from a very personal inner space—and I love what I do, precisely because I surround myself with people that I admire at a human level; people whom I genuinely feel that when the chips are down or a storm is raging, we can lean on each other. In today’s world this is very difficult for a gallerist to build, but what I do is not separate from who I am. This is my life and, especially because of how I work, if I bring an artist into the gallery, then I am bringing a real human being into my life, with all of his or her complexities. I think my artists appreciate my approach and I have certainly become a better and more complete person and gallerist because of it. I always tell my collectors, “I don’t sell art. I sell my artist” – which I think explains it all. Why did you choose SoHo for your gallery? You know, this is a question that I am very frequently asked. Initially, I never planned for or desired a gallery. I just wanted to represent and work with artists and do secondary market. 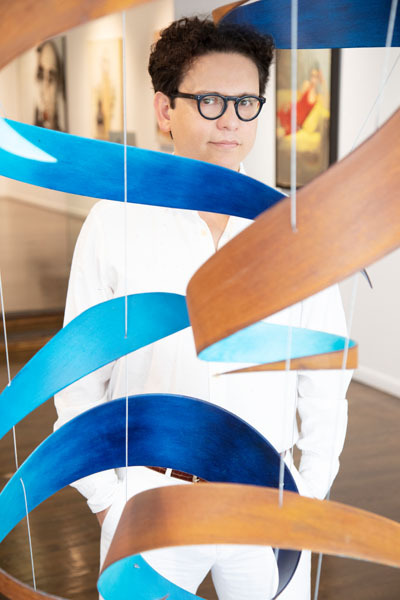 But I quickly realized that my artists and collectors would be better served if I had a space to hold exhibits —especially for large sculptural pieces like those of Kristin Jai Klosterman. So right away, I decided that if I were to open a gallery, then it had to be a space that was meaningful to me and with some sort of significance to the art world. This place was and still is SoHo. For example, the work of Leo Castelli has been one of the most influential and impactful on my life as a gallerist and art dealer. Castelli had a gallery right here in SoHo at a time when so much of what we consider to be the “contemporary art movement” in America was taking place. There is clearly a legacy component to SoHo. Today SoHo is very different and much has changed, so it would probably seem counterintuitive to not go to Chelsea or somewhere in Brooklyn, but history and legacy became, and still are, more important to me. And although I have always been a bit idealistic and romantic about the art world, I objectively think it’s important to be here. Working with artists and selling art today have taken a very transactional and corporate feel–and I think this is wrong. I feel that this is a reason why so many people in the art world seem so unhappy. Selling a piece of art —which to me encapsulates so much, like the creative energy and hard work of the artist and gallerist, for example, should not be like selling any other goods. Art is special. Art is transformative, both for the artist and the collector alike, but somewhere along the road this was forgotten or ignored. So despite what the experts said, I decided to open here, in a place that still holds so much of the spirit of old New York. I also wanted a space that was impressive. So many emerging or mid-level artists can only be shown in small gallery spaces because of their price point and the risk that the gallerist has to take on them. I wanted to make sure that if I were to show important emerging artists, then it had to be in a place that did justice to their work. Don’t get me wrong; it has not been easy. It has been one of the most difficult things that I’ve ever done. I feel I’ve aged a lot since opening almost 4 years ago —but it’s a labor of love and at this point, I can’t stop —the sky is the limit. What’s the horizon in the next 6-12 months? I am always involved in projects and the gestation of new ideas. This fall we will be opening with Ben Birillo —who, in my opinion, is one of the most important and influential living figures in the art world today. I’ll even go on a limb and say that without Birillo, Pop Art, as we know it today, would not have existed. Ben has been called both the “Progenitor of Pop” and “Mr. Pop Art.” He was a major force in the establishment and legitimization of Pop Art as real art both in the United States and abroad. He has been making significant contributions to the art world for over seventy years. Ben is best known as the mastermind behind The American Supermarket, a landmark exhibition widely credited with placing Pop Art on the map. The show celebrated the spectacle of consumption during the postwar years. Birillo commissioned his friends and colleagues to create additional objects for the show. When it opened in 1964, The American Supermarket included artworks by Andy Warhol, Roy Lichtenstein, Richard Artschwager, Tom Wesselmann, Claes Oldenburg, and Billy Apple. Ben is a true visionary and innovator – a kindred spirit —I am inspired by him. Ben’s solo show is also very special to me because of his shared friendship and meaningful connection with Leo Castelli. Both were of the same mind when it came to recognizing great art and talent. I often draw inspiration from Castelli’s work and legacy. I see him as an example to follow when making decisions related to the gallery. In 1964, Leo Castelli saw that Ben Birillo was talented and strongly encouraged him to produce The American Supermarket. Presumably, Ben probably wouldn’t have done it without Castelli’s persuasion. It turned out to be a groundbreaking show. Now, here I am in 2018, and after more than a year and a half of working with Ben, we are finally ready to present Spirit Dogs, his very first solo show in almost twenty years—the exhibition runs through early October. I couldn’t be more excited! 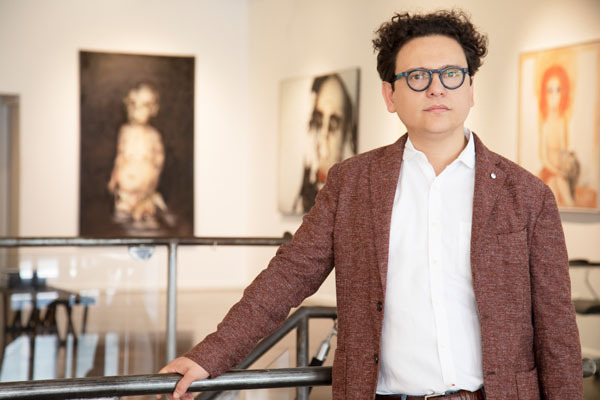 What are the biggest challenges being an owner of a gallery? When I first opened, I was a wide-eyed innocent regarding what I was about to embark on. My singular focus was to have an artist-centered gallery. I took risks and brought to light artists that I intuitively felt were too important to not be shown. I never took into account the logistics of actually running a gallery. 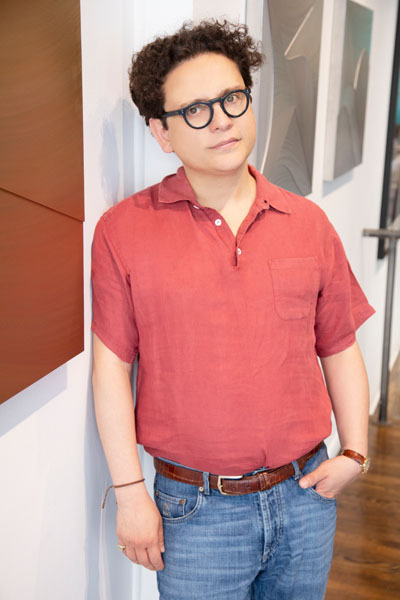 Admittedly, the first few years were very tough —there was a litany of issues like the exorbitant rent, staffing challenges, and many of the other things that any NYC gallerist similarly experiences and complaints about. But I have always kept my eye on the ball. I didn’t want anything to decrease my motivation or to distract me from the goal that originally inspired me to take this journey. I truly believe that in the same way an artist is born into the “artistic life,” so is the art dealer born to live the “art dealer’s life.” You have to be born for this because it is not easy. It is very difficult to sustain. You need to love it. You need to be made for this. I live and breathe this life. I can’t think of a moment when I am not working, although it never feels like work. I have been known to send a flurry of emails in the middle of the night, overnight. I suffer from insomnia–I give birth to some of my best ideas for projects and exhibitions late at night. I have even found myself reviewing artists’ work and corresponding at 2 or 3 in morning. While I always feel that the soul of the gallery comes from my artists and the exhibitions we put together, I wanted to be in SoHo because so much of what we love about art today came from these streets. Yes, time changes and people move on, but it is important to have at least one space that serves and honors the spirit of the New York City we all love —the New York of Leo Castelli, Warhol, and Basquiat.